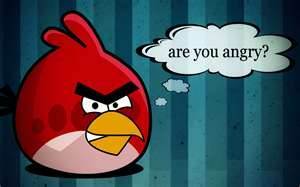 Am I the only person who doesn’t “get” the Angry Birds game? Can someone please explain to me why the game is supposedly so “addictive” and “fun” ? I got the app for my tablet, and my boys think it’s the best thing since sliced bananas. They also got Angry Birds Space, and the Seasons version. They were unable to explain WHY they liked it so much, other than it’s fun. I was totally bored with it in about ten seconds. What really drove me crazy was waiting for the little blocks to fall, or the pigs or whatever to finish falling off the buildings . It really made me think of PONG. Remember waiting for your “ball” to get to the other player? BLOOOOOOOP. blooooooop. BLOOOOOOOOOOOOOOP. Like molasses in January. Maybe I am too ADD to play video games, and that is why they don’t appeal to me. I don’t know. Or maybe I’m just weird. 🙂 Thoughts? No, no. Maybe I really don’t want to know!